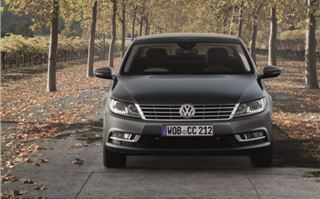 You're unlikely to be fooled by the name or the looks, but just in case, yes the 'new' CC is basically the revamped version of the Passat CC that was launched in 2008. 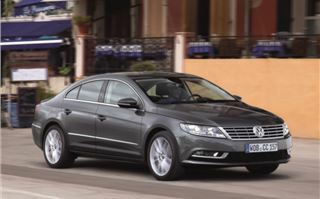 Volkswagen has dropped the Passat part of the name to give it more of an identity of its own, while the design has been updated with the latest Volkswagen family styling. 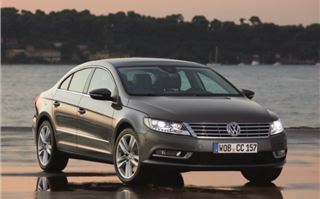 It actually looks a lot like the Phaeton which helps the upmarket image Volkswagen is aiming for. So while it's not strictly new, the CC has been thoroughly updated. It still retains the coupe styling with a low roof, frameless doors and a sleek profile, but is now a bit sharper and squarer. 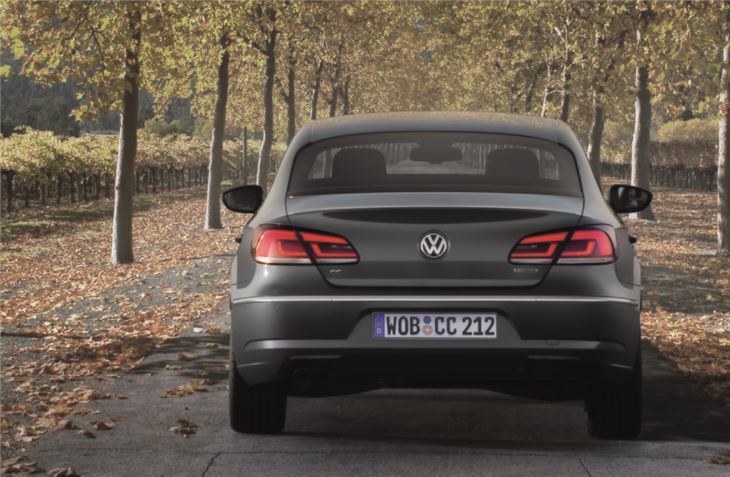 There are also new LED rear lights at the back and a chrome grille at the front. Some would argue it’s not as distinctive as before but that’s a matter of taste. Inside it has been given a revamp with the latest Volkswagen layout including a new steering wheel while impressively all models come with touchscreen sat nav as standard plus DAB digital radio and Bluetooth. Sitting behind the wheel, this feels like a premium motor. 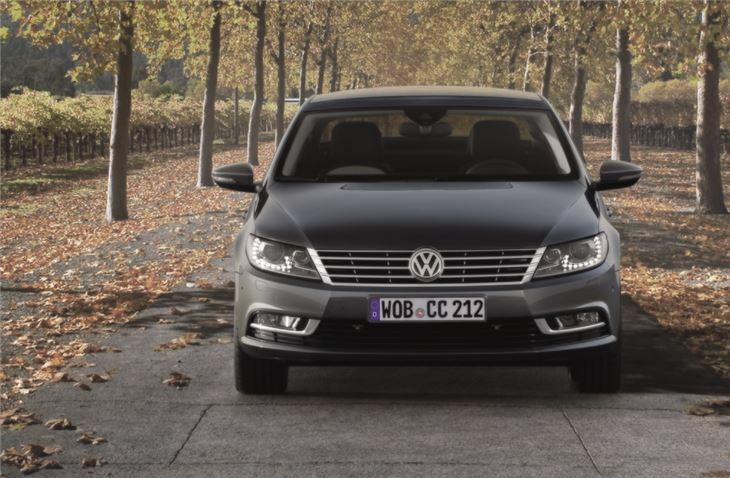 But while Volkswagen may want people to think of the CC as a junior Phaeton, the interior is most certainly Passat. That’s not a bad thing though. The finish is top quality and there are some nice interior trims, switches that are pleasant to operate and even an old school clock in the middle of the dash. It’s got hands and everything. 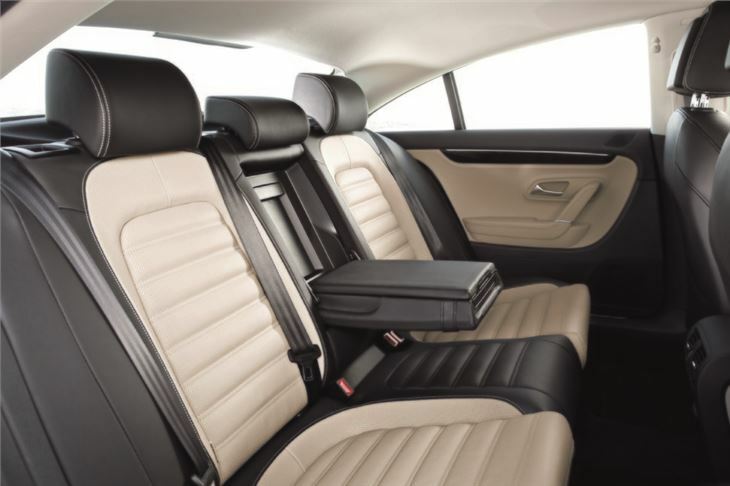 In the back it’s particularly spacious with plenty of legroom and decent head space too. 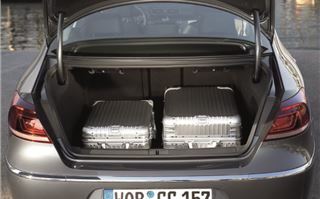 As before the boot is 452 litres and so can easily cope with plenty of luggage and shopping. For fans of punctures, you’ll be pleased to know it has a full size alloy spare as standard. 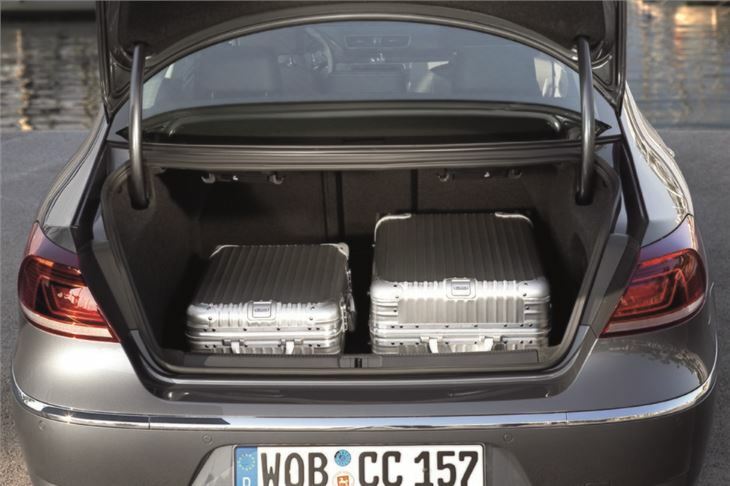 Our favourite feature is one that is also used on the Audi A6 Avant. Called Easy Open, this option means you can open the boot just by swinging your foot underneath the back bumper. True, it sounds like a gimmick but if you have arms full of shopping or you’re carrying a heavy box, it’s really useful. Although it is a £525 extra. The cheapest version of the CC comes with a chain cam 1.8 TSI engine but don’t be put off by its small size. What it lacks in capacity it makes up for in power with 160PS and plenty of torque thanks to the fact it’s turbocharged. It’s a very enjoyable engine to drive with real get up and go, but best of all you don’t have to rev it constantly just to get decent pace. It’s also pretty economical with a claimed average of nearly 40mpg. If you’re not planning on doing big miles then it makes a lot of sense. 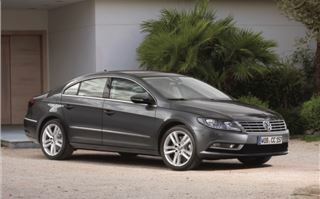 The other petrol is a chain cam 2.0 TSI with 210PS – an engine shared with the Volkswagen Golf GTI among others. As you’d expect it’s good fun and rapid too with a 0-62mph time of 7.6 seconds. 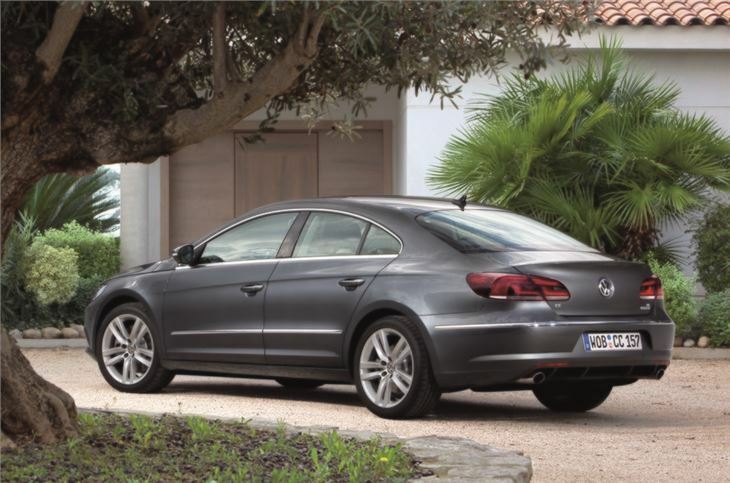 But most people buying a CC are going to go for the trusted 2.0 TDI – an engine found in across the Volkswagen range. It’s available in two versions – one with 140PS and a more powerful 170PS. The lower power version is the most popular and Volkswagen reckons it’ll account for three out of every five CCs sold in the UK. 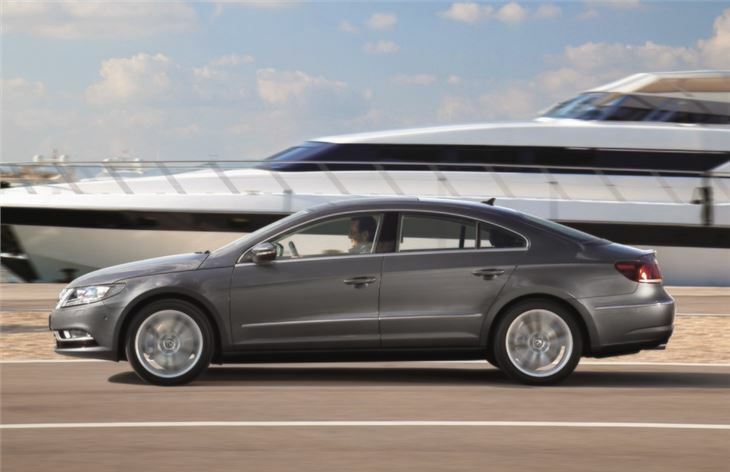 It’s easy to see why as it’s refined, has plenty of pulling power, and is also very efficient to boot. The official average economy figure is 60.1mpg and CO2 emissions are just 125g/km making it the best choice for company car drivers. The 170PS version is noticeably quicker and pulls really well in gear, while economy is still impressive with a claimed 57.6mpg. Emissions are only 129g/km too. But it costs around a £1000 more than the 140PS and in everyday driving there’s really not much difference between the two, so you’re better off saving your money. 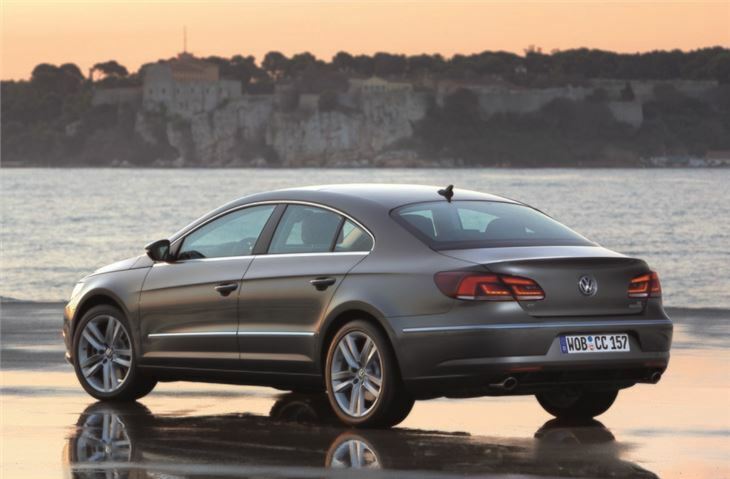 Both of the TDI models come with BlueMotion Technology which includes an engine start-stop system to help save fuel. 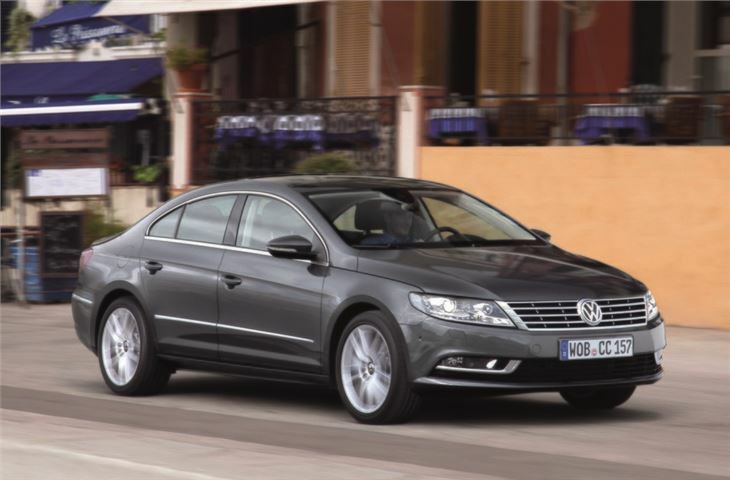 Interesting, on TDI models with the optional DSG automatic gearbox the fuel saving technology includes a free-wheeling mode which disengages the engine from the gearbox when you’re coasting. So if you come off the power on the motorway you’ll notice the rev counter suddenly drops. It feels quite odd and although it’s designed to be unnoticeable, the car does seem to slow down more than you expect, while when you go back on the accelerator, there’s a slight delay before you get power. 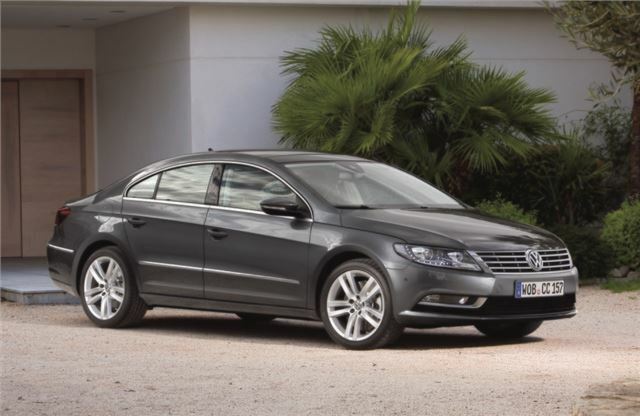 One good thing that the top TDI 170PS gets, along with the 2.0 TFSI, is a clever system called XDS. This has already been seen on cars like the Skoda Fabia vRS and basically uses the traction control system to mimic a differential. So in a corner it brakes the inside wheel meaning you don’t need as much steering input. The result is sharper handling and better traction too. It’s a very impressive system and one that will doubtless make its way onto more cars. 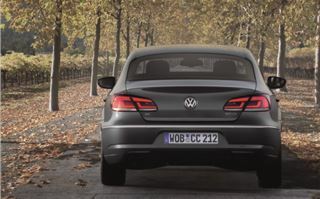 You really notice it on tight bends and makes driving the CC more enjoyable. But the CC is really more about refinement than anything else. It’s civilised on the move and unruffled by rough roads or potholes thank to forgiving suspension. But what impresses most is what there isn’t – noise. 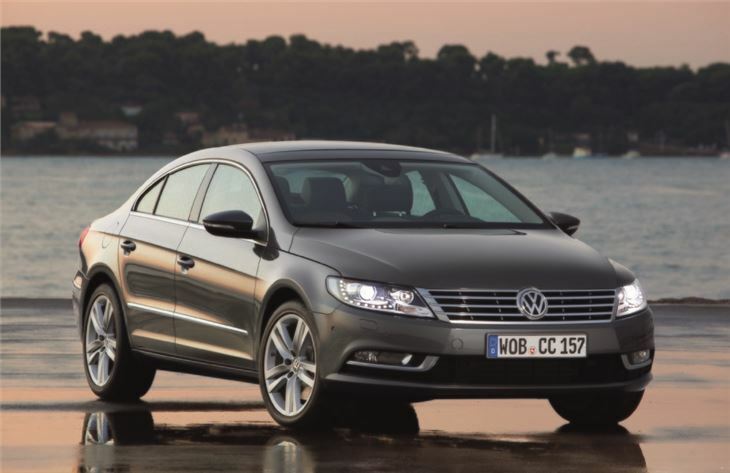 Reducing it was a big focus for Volkswagen compared to the Passat CC which is why it comes with a new acoustic film to reduce noise in the cabin while double glazed side windows are an option. So while the change in name is unlikely to fool anyone, this is more than just a case of rebranding. Volkswagen has improved the CC (or Passat CC in old money) in every area, making it feel a more premium product along the way. 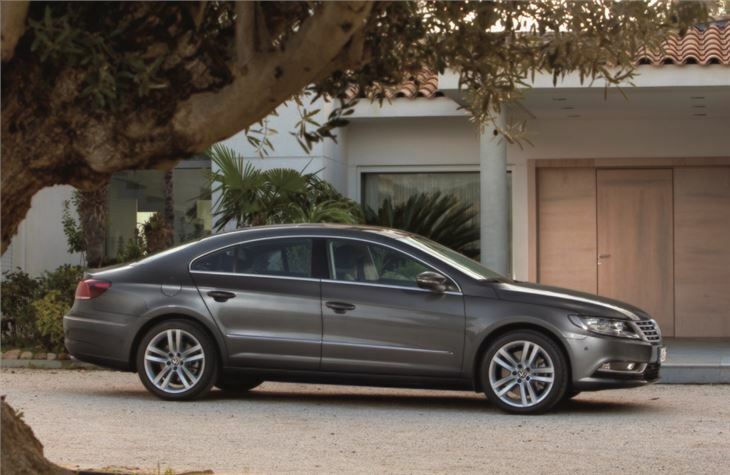 The 2.0 TDI 140 is the one to go for and with its good looks, spacious interior and strong performance, it’s pretty much all the car you need. 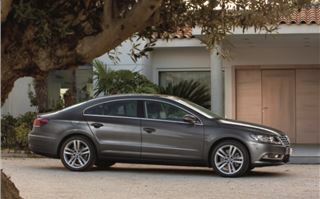 Stylish alternative to the standard Passat. Coupe looks with plenty of rear passenger space. Quality improvements. Owners call it "The Passat as it should have looked".